Yet when we look at all the old material from the First Fantasy Campaign, there seems to be no evidence of anything that could be construed of as an "Armor Class". Certainly none of the monsters have any sort of corresponding statistic in any of the old material anywhere. But then again, why should they? After all "Armor" class in a ship game only applies to the actual metal or wood plating protecting the ship. Think about that. We are so accustomed now, 45 years after D&D was published, to think of "Armor Class" as merely a general term for defense quality, we easily forget that "Armor" normally refers to a defensive shell or jacket of some kind, not skin or fur. Why would a monster have an Armor class unless it was wearing actual armor? In D&D, monsters have an Armor Class because it is inherent in the d20 combat method. The attacker's target number is determined by the targets AC. Giving both characters and monster an AC number was a decision per design - a design for a method we find no evidence for in pre D&D Blackmoor. Obviously then, for Arneson's statements to have validity, whatever he was doing in his game with Armor was something different. We seem to have a good handle on how a character attacked a monster in early Blackmoor, and unlike in D&D, it had nothing to do with a monster AC. Basically the player would roll 2d6 against their weapon score. If they beat it, they would seemingly roll all their Hit Dice for a damage total along with any bonus. Arneson also said he allowed a saving throw to avoid damage - probably only for Player Characters. For the typical monster "Armor Class" played no role. So, it is perhaps not surprising the FFC monster entries have no hint of Armor Class. Even the Balrog in Blackmoor dungeon wearing a mail shirt has no special numbers attached in consequence. So was Arneson lying or delusional regarding the claim that he added Armor Class to his early games? Did armor have any mechanical meaning in pre D&D Blackmoor? First, lets discard the notion that use of the term "Armor Class" or "Class of Armor" is somehow at all anything to care about. A rose is a rose, to paraphrase. What we are interested to answer is if Arneson had a method one might recognize functionally as "Armor Class", regardless of what he may have called it at the time. Further, we would be looking at this method as primarily applying to players. That is, that Armor would usually only be worn by player characters, and usually only be relevant to characters in mechanical terms. Further still, this application of "armor class" might be the key to understanding how monsters attacked player characters in early Blackmoor. We've seen plenty of evidence suggesting that players attacked via their weapon skill score, but there is no evidence at all that monsters attacked characters that way. In fact, lots of monsters don't use anything but tooth and claw, and it is clear that Arneson did not bother to roll up tooth and claw target numbers or corresponding weapon skill numbers for any of the monsters that did use weapons, They must have had some other kind of target number for determining hits. Initially, we might safely assume that Arneson continued to use the CM Fantasy Combat Table to determine a monster hit on a player. However, that table is quite limited in scope, and Arneson does repeatedly insist it was dropped altogether as they added more monsters and character types. So, if true, at some point Arneson must have introduced some other way for monsters to score hits on player characters, and that could certainly have been an AC type system. The robots entry appears in a list Arneson claims is of pre-D&D magic items. They are in fact all sci-fi kinds of things like tricorders and Medical Units. Dating this with any certainty is problematic, though non-standard references like +5 Magical Armor and "10-sided dice" make it feel later rather than earlier, perhaps well into 1973. Nevertheless that 1-6 AC for robots is really odd. For D&D 2-9 AC you would have to add 1, and even then you would be ignoring the possibility of AC 8 or 9. Why not use a d10 and ignore the 1 and 0? Taken simply at face value, it seems as though Arneson is saying he uses a 1-6 AC system. That robot entry was something I've puzzled over for a long time, but more recently two key bits of evidence surfaced that may shed light on this and what may have served as an Armor Class target number in early Blackmoor. The first is Dave Megarry's character sheets. According to Megarry, the "square" numbers written on his character sheets applied to "hit class / armor class" Across the 19 characters on the sheets, these numbers range from 0 to 4. Regarding those "square" numbers, Megarry said, "The armor class dealt with what type of armor you had bought or acquired: no armor = 0; leather armor = 1; chainmail = 2; plate armor = 4." What's particularly interesting is that John Snider doesn't seem quite sure where the numbers should go. The number 3 is entirely missing and 4 appears across from Chain Mail & shield, but has a dash mark clearly connecting it to just Chain Mail. What that hints at, is that the D&D/Chainmail armor scheme was not the same as the 0-5 system he is trying to map on to it. In other words, two different and not entirely compatible ways of categorizing armor. Megarry seemed to have the same difficulty with "3" in his description to me above. A generalized scheme like this is a possibility, but we should also consider that Sniders notes were referencing a more concrete scheme. These ideas are hard to test, but we do have some corroborating evidence, again from Megarry's character sheets. One of Megarry's characters does list what armor they owned. and as Megarry remembered to me back in October of 2016, "I was not much into shields as they used one arm in combat and was hard to carry. I liked bow and arrow weapons and did not use shields. I did like leather armor as it gave a minimal protection for a relatively cheap cost. The Scholaress did have chainmail as she had money..."
Note that in both cases, the square number matches the number on John Sniders list; 2 = leather, and 4 = chainmail. So in these two cases, there does appear to be a direct correlation between John Sniders armor numbers and the "square" numbers of Megarry's characters. Intriguing as that is, it isn't essential to try to guess whether "Leather Armor" corresponded to "AC 2" or 3 or whatever in Arneson's system, because it need not have been a 1 to 1 correspondence of this nature. It doesn't especially matter if it was or wasn't. All we actually would need to know is whether he did in fact have a numeric range, somehow going from worst to best, or vice versa, functioning as an "Armor Class" in combat. Without getting into the weeds on this chart, I'll just explain that it seems to indicate that type 2 through 5 guns (detailed elsewhere by caliber) are capable of penetrating the armor thicknesses listed up to 12" distant for rifled cannon and up to 6" distant for smoothbores. The important point to take notice of here is that we again see essentially 4 grades of armor. Otherwise, there is nothing about this table that seems readily adaptable to a single person melee game. Sure you could translate caliber of guns into various hand held weapons - but let's not go down that rabbit hole. Instead let's turn our attention to another section of the Ironclads rules which shows what score is needed by these same gun types at various ranges, from 36" distant, where only a wooden ship can be hit, to within 6", where all ship types can be hit. There are several of these tables for different ranges. Keeping in mind that we are considering applicability to hand to hand melee, distance effects on armor penetration are not the issue. So we will look only at the close range table. Let me be clear about what I'm saying. If, we take Megarry seriously and accept that the square numbers on his character sheet are "hit types/Armor Classes" and we take Arneson seriously that he derived an "Armor Class" hit system from his Ironclad game, we find a compatible expression of those two statements in the table representing armor penetration at 6" or less - which is of course where we would expect to find it. *Another way to express this would be to say that a shield adds 1 to "light" or no armor. We can play around with these numbers all day, but that's likely pointless. In adapting Ironclads to his game, Arneson had no need of a formal table. He had a mechanic in place: roll a d6 against a target number assigned to represent the armor. As referee, he need only decide for himself if the chainmail hauberk worn by the character constituted the equivalent of the 4"-8" category armor in Ironclads. It seems well within Arnesons modus operandi to have done exactly that sort of seat of the pants approximating. Nevertheless, the evidence from Megarry's character sheets coupled with John Snider's notes do seem to show a correspondence between particular numbers and particular armor types. There are some other niggling bits of information this method would also serve to explain. In my notes from a phone conversation with David Megarry in April of 2017, he said Arneson would ask your characters Armor class and then roll dice (d6's) to determine a hit. The number of "Hit Dice" rolled depended on the strength of the monster - bigger monster = more dice. This has long bothered me because it makes no sense in terms of either the weapon based hit system we see on the character sheets, or any of the CHAINMAIL systems. Even the mass combat table, which does incorporate rolling more dice, does so to increase the opportunities for the number of straight kills, without any concern for armor. It is a different sort of system for a different sort of combat problem. However, Ironclads does increase your armor busting dice based on "the strength of the monster", or rather the number of cannon you bring to bear on the target. For the heavy guns, you get 1 die per gun, ranging to the lightest guns which are 4 guns per die. Note, that these target numbers don't themselves change with the "experience" of the ship, which, translated into a character based system would mean the target number to penetrate a suite of armor in melee was whatever it was, the same regardless of the level of the character swinging the sword. The increased chance for a hit would be purely in having more dice to roll. The natural way for us to read this is to equate HD to damage dice, and indeed, that may be correct. However, it is also possible that it means more than this. The "Blackmoor System" need not have been some singular clean method. Perhaps characters and creatures roll all their HD when attacking, as suggested in the Ironclads derived method above. In this case, the unarmored target would take the full number of hits indicated by the HD, possibly mitigated by a saving throw for no damage. The armored target would only take as many hits as have successfully penetrated their armor. In Ironclads, each hit resulted in 1 point of damage, however it would be possible to determine the amount of damage by the number of points above the armor roll or simply equal to the number rolled. Alternatively one could roll a separate damage roll if needed. All this works fine for monsters attacking characters. But, player characters have weapon skills, and can roll against their weapon skill when attacking monsters to determine a hit. So in this case, with successful hits, the player would roll all their HD for damage - a distinct advantage since it would seem to ignore monster armor. Both these uses of "Hit Dice", as damage dice, or as "to hit" dice, can work together quite easily, and may well have been used that way in Blackmoor . Secrets of Blackmoor Premiere Announced! That's right. The long awaited premier of the Secrets of Blackmoor documentary has been announced for May 9th. Also stay tuned to the 'blog this month - I have some really interesting pieces I'm going to release and some new things to talk about. Ever since images of the campaign map from the Castle and Crusades society began floating about the world wide web, folks have taken an interest in locating the area where Blackmoor was supposed to be. One of the best attempts came, of course, from Zenopus, seen HERE on his blog. For some time now, my running campaign has been set in a version of Blackmoor that is part of the C&C world, and even though my players have thus far not ventured beyond the Northern Marches, I thought it high time I make a map. 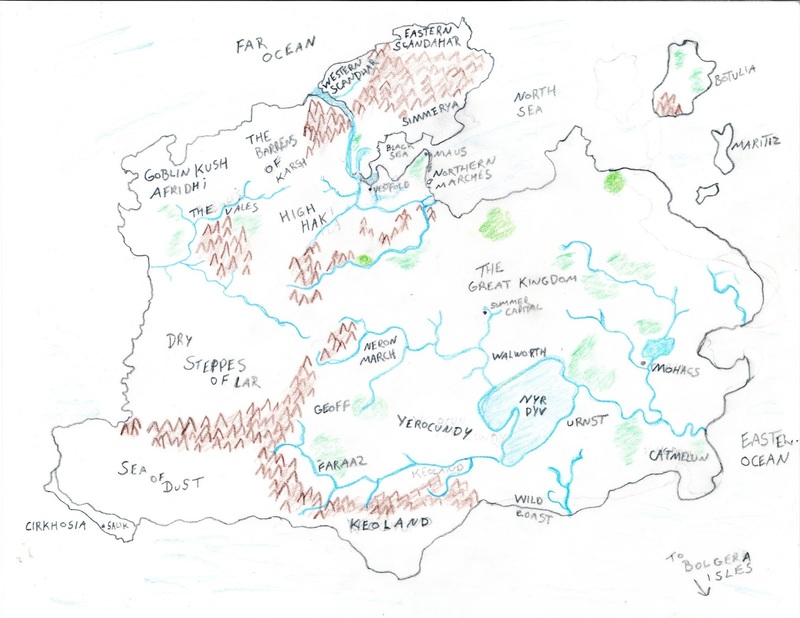 The idea is pretty simple - what could a C&C world look like if it took into account the lore and geography of Arneson's Blackmoor. In other words, a Blackmoor world version of the C&C map. Or I should say "maps", because as we have talked about HERE, there is more than one version which I took into account. 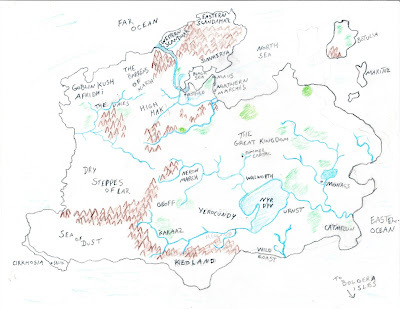 Anyway, below is my somewhat crude (hey, I'm no Raphael) but eminently functional world map of Blackmoor. Feel free to use or improve as you please.